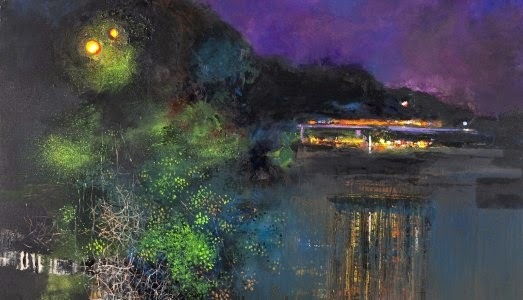 I first came across Kurt Jackson’swork at Newlyn Art Gallery in 1999. I think he is one of the most fascinating of contemporary artists. He is primarily a landscape painter, although he works in other media too, such as ceramics and sculpture. What first fixed my interest most about his paintings was the way in which he manages to capture the reflection of light on the surface of water. It is an element which recurs in many of his paintings, but the one which really caught me and had me hooked was a painting titled High tide. St. Mary’s from St. Martin’s, Scilly, 1.11.98. It is a watercolour (11 x 11 inches). The top portion of the painting shows a luminous bank of dappled cloud, beneath which, on the line of the horizon, is a low headland with a bar of rock or two islands in front. Part way down the painting, still in the upper quarter of the scene, is a thick horizontal bar of shadow on the water cast from somewhere unseen overhead by a bank of cloud. The rest of the foreground is essentially a shimmering seascape of white, but the focus of the painting is the warm, dazzling patch of light radiating out between the two rocky silhouettes before the headland on the horizon. It’s an intense reflection of sunlight from somewhere overhead or behind the viewer, which draws the eye in, travelling across the water. It’s the kind of scene which draws and calls you inwards; it makes to want to cross the water and see what’s on that island. As in life, when looking out from a Cornish cliff, so too with this painting – it’s a call to journey on, and I defy anyone looking at it not to feel that pull, the urge to go and see what lies beyond the bar of sunlight, across the shimmering glints of the always moving sea. It’s an often-seen characteristic of the light on the waters around the Cornish coast (something which in part has drawn many artists, such as Stanhope Forbes, Walter Langley, Samuel John 'Lamorna' Birch, Ella and Charles Naper, Dame Laura Knight, Doris 'Dod' Procter and many others, to the region). I’ve managed to catch it in some of my photographs. But the joy of watching it for real is that its stillness and serenity isn’t static, it’s ever changing. And it is reinforced by the elements and their effects on all your other senses. The smell of gorse, ferns, lichen covered granite, and rich earth mixing on the sea breeze; the salty tang which you can taste as well as smell, and feel smarting on your cheeks, heightened by the strength of the sunshine, whether in cold or warm weather, the same but different in each season. 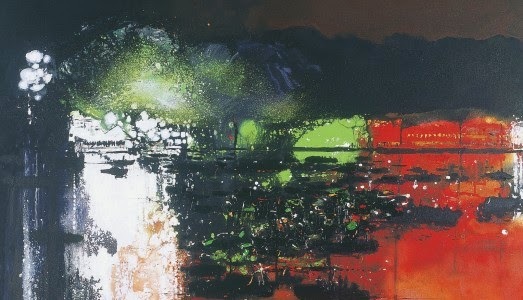 Kurt Jackson captures all of this in his paintings, and incorporates it, either by ripping up a tuft of dried grass with which to move the wet paint around on the sheet itself or by scribbling a spare, elemental poetic note in the corner or along the bottom of the painting – describing the scents in the air, or what was happening around him whilst he was painting. It’s a way of characterising and recording a part of the world which I love that I can really relate to and understand. For me it embodies that elemental feeling of being immersed in the landscape around you when you set out to lose yourself within it; simply exploring the natural world, letting it pervade your senses and your perceptions as you ramble ever deeper into the clefts and folds of the coast, its cliffs, valleys, and tree sheltered streams, or the exposed rocky outcrops, and the wide open vistas of the moorlands. Last weekend I spent a couple of hours immersed in Kurt Jackson’s latest exhibition, currently on show at the Horniman Museum in London (on until January 25th 2015). 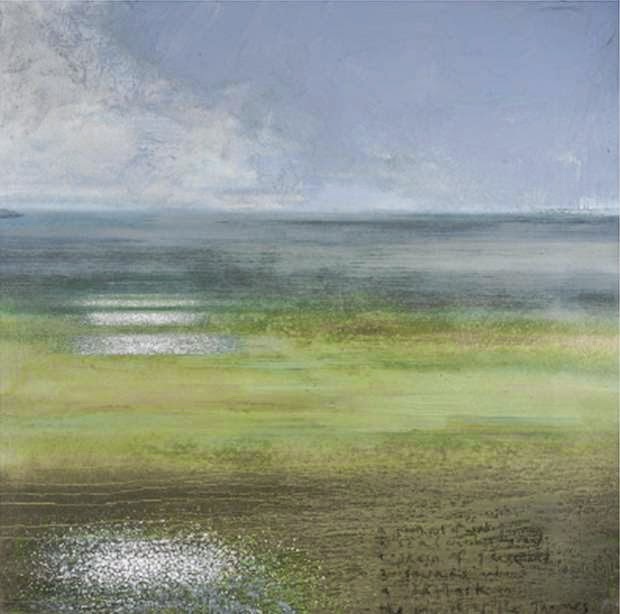 The exhibition is titled Kurt Jackson: River – and, as the title suggests, it looks at the artist’s long-running fascination with following rivers, often from source to sea. A number of different river projects are showcased in the exhibition, documenting not only rivers in Britain but rivers right across the world – in Europe, Africa, Asia, and the Americas, from the artist’s earliest studies in the 1980s up to 2014, in sketchbooks, drawings, and etchings; from small and deftly spare watercolours up to vast, dense and thickly frenetic oil paintings on canvas. 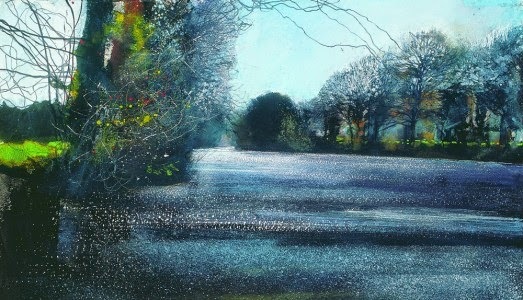 There are also two films which show how Kurt Jackson works, often en plein air – outdoors, working directly from nature in all weathers, in sun and snow, fair weather and biting frost; painting with brushes, flicking and dripping the colours; using his fingernails, his barefeet, or the soles of his boots; painting is a messy and strenuous business, standing upright but bent double over his canvases spread out on the ground, his clothes often stained and smeared with as much paint as the surfaces of his paintings. The idea of following rivers is another one which speaks to me too. As a child growing up, there was a stream flowing past the end of our garden which I’d often explore, wading along in my wellies, hunting for sticklebacks, even finding leeches living in the mud of the riverbank – I did an unexciting study of its water quality for a GCSE Biology project; the water quality was found to be quite good and healthy, despite the fact it sometimes stank like an open drain. The project was perhaps (from my point of view at the time) ‘unexciting’ because I looked at too short a stretch of the river. I imagine other parts of the river – where it was culverted under the centre of our town – may have been more stagnantly acrid and polluted. I eventually ended up doing my final A-level Geography coursework project on the local government management of this little river and its impact on the lives of local residents along its course as it occasionally swelled in exceptionally heavy rain to flood the lower half of our back garden as well as other parts of the town. This early enjoyment of exploring river courses didn’t end here though, I later went on to wade up and down similarly narrow channelled streams while jungle-trekking on the remote island of Guam in the midst of the Pacific. I’ve also found myself following the courses of other, more substantial, rivers – such as the Thames; the Rhine; the Seine; the Tiber; the Nile; the Mekong; the Yellow River; the Huangpu in Shanghai; the Tamsui in Taipei; the Sumida in Tokyo; the Yodo in Osaka; the Han in Seoul; and several fast raging rivers in the mountains of Sichuan. Rivers are a way of knowing our own world. They have been the mainstay of our lives for many generations. Most of the major cities of greatest longevity have been built at key points along the courses of major rivers, and for good reasons too. Rivers flow through our society like blood through our own veins. 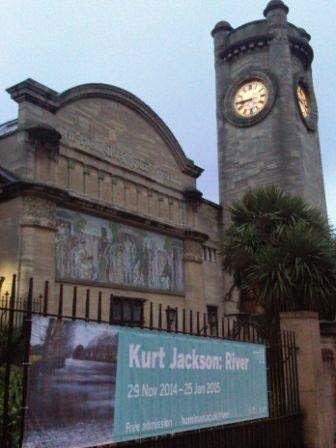 “How do you paint society’s attitude to rivers?” Kurt Jackson asks. And, as this exhibition shows, his paintings are aggregates of all these elemental aspects of rivers, both light and dark – where the smooth surface of the water is often the still but moving centre of the image; whether narrow-channelled and embanked, or wild, open and running free; skilfully incorporating the flotsam and jetsam influences of unseen people along the meanders and mud channels, the rubbish accumulated at the high tide line, or the lush, tangled vitality of verdant overgrown riverbanks teeming with foliage, brambles, or the stark, jagged silhouettes of bare leafless wintertime trees; the shiny mudbanks oozing life and light, all rendered in “splatterings, scumbles and smears” of paint upon a taut flat surface which has been brought to life like a passing moment pulled out of time and ever remembered thereafter. My special thanks to Kurt Jackson and Zinzi Tucker for kindly giving me permission to illustrate this review with images of Kurt’s paintings. All images are ©copyright Kurt Jackson, 2015. 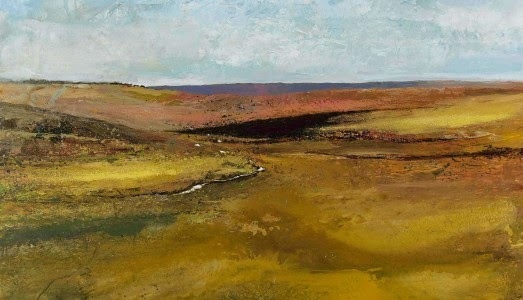 See www.kurtjackson.com| @KurtJacksonArt for more information and updates on Kurt’s paintings and exhibitions.